Our flat pack base units units are available in a choice of five, fabulous finishes. 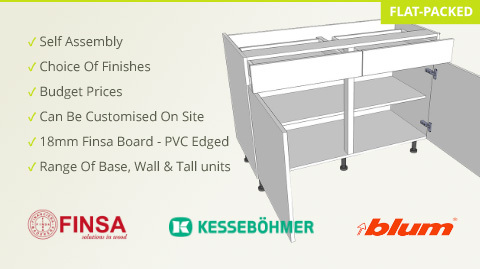 Designed for self assembly, these kitchen base units can also be customised on site. Choose from single, double and corner units along with 500mm or 600mm drawer housings and drawer packs. Part of our range of flat pack kitchen units, all base units are made with 18mm, PVC edged Finsa board.